Instagram might be the land of selfies, sunsets and food pics— and that’s totally fine with us— but it’s also home to some of the most creative social media minds in the business. Marketers, businesses and individuals have come up with incredible ways to make use of the every-growing photo social network. From hiding dogs to selling sheep, here are 10 creative or weird uses of Instagram that show just how awesome the app can truly be. Leave it to Ikea to do something simple but innovative. With the help of an ad agency, the Russian division of Ikea launched its new PS 2014 collection using Instagram as a website. If you follow ikea_ps_2014 on your Instagram app, you’ll see 12 images— 6 of which represent catalogue-style categories of products like benches and lights. Each of the products within these images is ‘tagged’ and clicking a tag will bring you to individual accounts for each lighting fixture, carpet or side table. Once there, you can see more photos of the product in question and get inspired on how to work it into your home decor. Then click through to their actual website to buy it. During the US Open tennis tournament, Heineken decided to give fans a chance to win tickets to the men’s final by hosting an interactive Instagram photo hunt. To do so they stitched together over 200 photos on the @crack_the_us_open Instagram account, creating a giant panorama photo of tennis fans watching a big match from the stands. Then they asked their community to hunt for a particular fan and follow a set of clues which would lead them to a real pair of US Open tickets. A whopping 1,500 people took part and lead to a 20% increase of the @Heineken_US account. When The Vaccines needed beautiful imagery for the new music video, they put a call out to Instagram users everywhere to take photos at shows and festivals and tag them #VACCINESVIDEO. It worked in epic fashion, and the band ended up with 2433 tagged photos. They used those images to make the first Instagram music video ever, a beautiful clip which now has over 2.3 million views on YouTube. The US Transportation Security Administration, or TSA, is known to most people as annoying airport security. But there’s a reason they scan all of our bags, and the TSA is putting that reason on display on Instagram. Their feed is a gallery of weapons, drugs and other items people have tried (and failed) to get past security. These range from the friendly fireworks of your childhood to live grenades and even freakin’ batarangs! This odd assembling of objects has earned the TSA over 95,000 Instagram followers and counting. We all know that Instagram can be a good marketing tool, especially for clothing stores, restaurants and… sheep salesman? Several livestock businesses in Kuwait saw an opportunity in the rising popularity of the Instagram in the Middle East, using it to share photos of the sheep they had for sale along with their phone number for interested parties. Kuwait is big importer of sheep, and local companies are trying to break into that market with the help of a free e-commerce platform in Instagram. Benny Winfield Jr. wasn’t satisfied being a customer service rep. 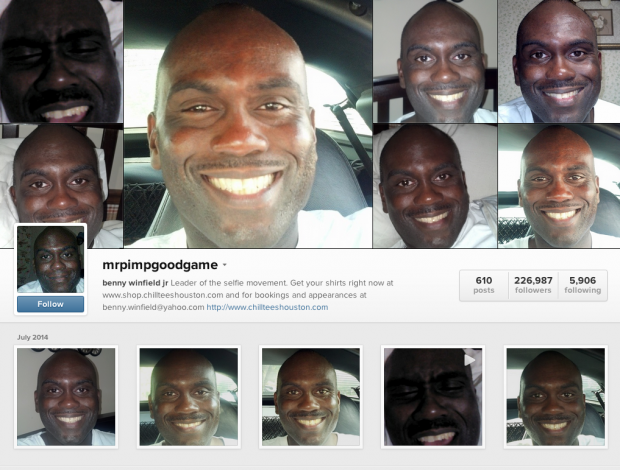 So, he adopted the moniker of @mrpimpgoodgame and decided he would become the king of the selfie. Winfield has earned himself over 200,000 followers with his 610 Instagram posts, almost every single one of which is a selfie of his own face— adorned with a slight smile and shiny head. Why take so many selfies? In an interview with Vice, Winfield said “The selfie movement is about loving the way you look, even if you’re having a bad hair day. No matter what. It’s always appropriate to take a selfie.” Inspiring words from the man, despite the fact that he admitted about 30% of his photos come when he’s on the toilet. When Instagrammer Jessica Johnson started travelling the world, she decided to share photos of a little stuffed fox that she brought on every trip— a fox given to her by family friend Gary Moore 32 years earlier when she was just 3 years old. But when Moore was diagnosed with stage 4 cancer, Jessica decided it was him who deserved a vacation. So, she started raising money to send her friend on an amazing trip with the help of Mr. Fox. Jessica created a GoFundMe page where people who enjoy the Instagram photos and story of her little stuffed animal can contribute to the trip of a lifetime for Moore. Her efforts have earned her media coverage across the globe, from the likes of Buzzfeed and Metro. They say life is about the journey not the destination, and glasses brand Warby Parker took that to heart when they came up with the concept of Insta-Walks. These events invited fans to walk from the company’s headquarters in Soho, NYC, to a rooftop party in the Meatpacking District— taking and sharing Instagram photos the entire time. Doing so earned the Instagrammers free drinks, while providing Warby Parker with a jam-packed branded event and a slew of great marketing photos. In 2013, the Toronto Silent Film Festival was looking for an off-beat way to tease their annual event on Instagram. With the help of ad agency Cossette, they came up with an incredibly creative and appropriate way of promoting the festival using Instagram like never before: by creating video on Instagram before Instagram Video even existed. By using multiple photos and the scrolling functionality of smartphones, they were able to essentially create short film reels. Cossette’s Co-Chief Creative Officer Matthew Litzinger told Ann Handley “In his time, Chaplin and silent films were as innovative as it got…and every new film broke through some technological barrier and used the medium differently than the films previous to it. So that’s what we’re trying to do as well.” Check out the reels below.